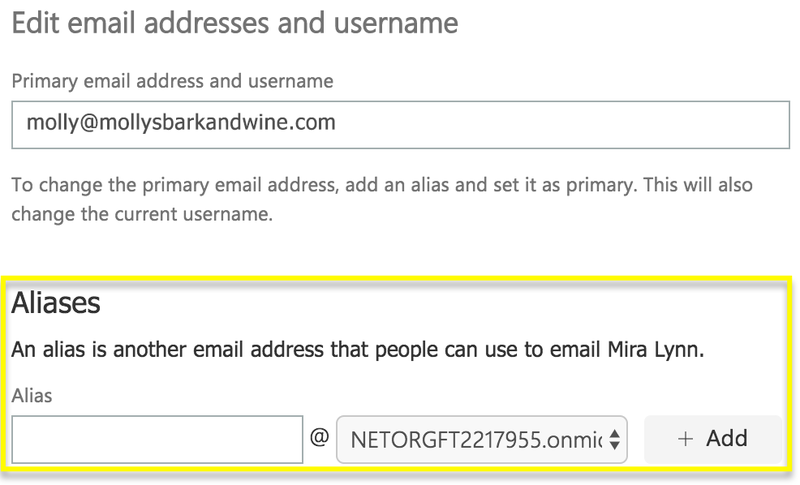 If you want additional email addresses for a single inbox but don't want to pay for more licenses, you can create multiple alternate email addresses using "aliases". Want to know more about email aliases? Note: You must have admin permissions to manage email aliases. Log in to your Office 365 Microsoft portal. (Need help logging in?). On the left, under Users, click Active users. If the navigation menu is collapsed, look for . Click the address you want to edit. Next to Username / Email, click Edit. Find the Aliases section of the page. In the field under Alias, enter the first part of the email address you want. After the @ symbol, select the domain. Note: The generic onmicrosoft.com domain is selected by default. Click there to select your personal domain. Click Add. You will see your new alias address appear below. Below the new alias address, click Save. You will see a summary of your changes. Click Close. Note: If you plan to use the email encryption service, you must add the alias to your email encryption account. How to add an extra email to my workspace email?